Through telepathic conversation with your Higher Self and Being of Light Guides, as well as advanced work with your Holographic Field, Deb will provided detailed information, Insights, Activations, Clearings and more during your session. Sessions are done wherever you are geographically. Through telepathic conversation and clairvoyant “seeing” details are revealed to Deb from your Higher Self and Being of Light Guides. Deb will be guided as to what is in your Highest Good as "low hanging fruit" to talk about as first priorities to support you. Yes, you can ask questions - there's usually back and forth dialogue, unless you go into an altered state, at which point, Deb continues to do the work and all information is on the recording. She will Clear Your Field and also ask permission to communicate with your Higher Self at the beginning. She will also tell you what (advanced) work she's doing with your Holographic Field, so you have an intellectual understanding in addition to the experiential experience. She will also interpret any Light Language communication that comes through. Hi Deborah. THANKS A MILLION for the completely AWESOME ACTIVATION that you gave me today! It was AMAZING! I thank YOU and God, the Archangels, Angels, Ascended Masters, Spiritual Guides, my Higher Self and everyone else I didn't mention- from the bottom of my heart! I love and appreciate everything you told me in the Reading part, and also the activation is "mind blowing"!!!! I know it will affect my life GREATLY! 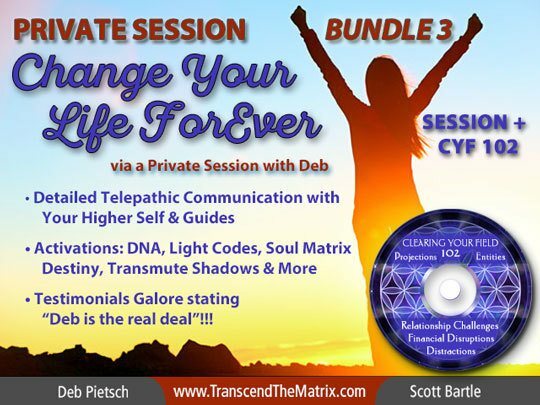 I've been fortunate enough to have private sessions with Deb at various important turning points and moments in my life for more than five years. Being able to conduct the sessions remotely make it very convenient and comfortable, and sometimes I get even more than I bargain for in the sessions, but its always on point and too the point, Dang it! Being able to listen to the recording later that Deb sends through, and review each session as often as needed makes it an extremely valuable self-training tool. Every time I listen to it I hear something new or I am reminded of something basic or profound (or anywhere in between) that I need to keep at the front of my mindfulness. I cannot tell you how highly I value each and every private session, and in fact every interaction I have ever had with Deb, and as such I highly recommend you lock in at least one session with Deb. You're sure to find it to be a life-changing experience, like I did. Letting Go - Kicking & Screaming! I have had several private sessions with Deb that were beyond description. 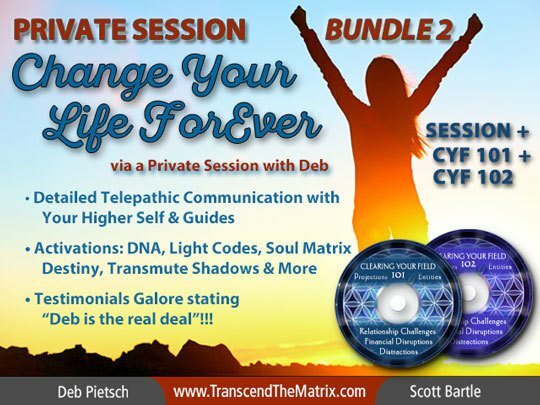 I experienced very powerful physical and emotional reactions while in private session with Deb. She has been very accurate in pinpointing roadblocks in my spiritual development and has guided me thru these, sometimes with me kicking and screaming! It has been hard, at times, to let go of the old me in order to clear the path to who I really am. With the help of Deb, I am such a different person now and it's only going to get better! I am looking forward to what's next. It's gonna be great! The first time I heard Deb speak was over a 'group call', and I knew immediately that she was someone special, someone who had integrity, insight and an undeniable connection to trusted guides and important wisdom. Most importantly, she shared with intuitive bluntness, love, light and humour. 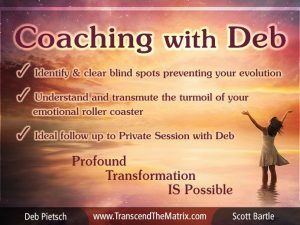 After each private session I have had with Deb, I always felt more confident and focused to make the necessary moves forward in my life. Each session brought me clarity, self knowledge and feedback to helping me tap into what is my best interest for my Highest Divine Good and Truth. Review all aspects of your current life; relationships, job/career/mission, spiritual journey etc. Does It Matter WHERE you are geographically? No. Private sessions are conducted globally via Skype or a U.S. based Conference line. Private Sessions are not conducted in person to minimize any distractions (especially during the Activations and Light Language, which Deb's mouth moves "weirdly fast". This greatly assists you in staying present with what's going on ~ because there's usual A LOT going on. Sessions vary as they are dependent on communication dedicated to each individual. Typically, a session will last an hour. Afterwards it's suggested to leave 1-2 hours for quiet time to allow for integration of the information and the Activation energy, which will still be "working it's way" through your energy fields. The .mp3 recording of your session will be emailed to you 2-3 days after your session. HOW do you engage in your private session? All Sessions are recording so you are NOT taking notes, but rather, are relaxed / reclined and in “RECEIVING MODE” for the information & insights coming from direct telepathic conversation with your Higher Self and your Beings of Light Guides. You’re also in “receiving” mode for the energy, Activations, Clearings and other “work” being done by and through Deb. WHAT kind of information & insights can you expect? Very detailed. Most people are rather surprised and / or (joyfully) shocked by the level of detail and clarity that Deb is able to communicate about on your behalf. The important thing for you to remember is that Deb thoroughly "CLEARS YOUR FIELD" (with your participation) and commands that "only information that is in your HIGHEST GOOD is what is communicated and brought through. Is Telepathic Communication Different From being a "psychic"
Deb does not refer to herself as a psychic, but rather a "telepathic communicator" and an "Oracle"... these are 2 different aspects of Higher Dimensional existence. The telepathic communication is conducted just like being on a phone with a party on the other end... conversation and clarity is conducted moment to moment with your participation. Deb's Guides refer to her as an 'Oracle' - the usage of which was only shared in public as of 2015, which plays a role in how she is able to assist people exponentially in being able to understand and move forward with their Highest Divine Alignment and Beingness. Additionally, the term 'Psychic' is often associated with predicting the future. To do this would mean 'free will' is non existent insofar as all choices resulting in a predicted outcome must be known in advance. Deb honors free will at all times. How can you expect to benefit from One or More private sessions? Through the detailed information that comes through, along with the Clearings, energy shifts and the Activations, you have a lot of different ways that your day to day can shift. Working with the information from the session – through the recording – is commonly done for both more of the energy Activation and the details of how / what action to engage with in order to move forward with certain aspects and elements of your life. 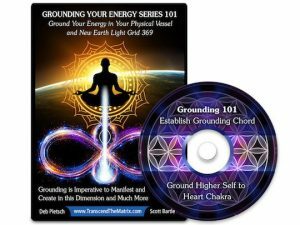 What is the Energy work that Deb is most known for? Activations - powerful ones! Until you experience an Activation and the powerful potent experiences with it, it's a little challenging to try to describe. This list below is just a broadstroke review of what's possible ... many elements are difficult to describe in words. Begin getting very clear about the foremost issues you are dissatisfied with in your life by starting a list, a journal or other means of engaging with these aspects. Start paying attention to dream experiences and "signs" that show up in your physical surroundings, which could include a "feeling" of needing to pay attention to something specific. And definitely don't "fudge" on clearing your field and / or working with the pre-requesite session tool. There is a prerequisite experiential tool that must be engaged with daily for 7 days prior to your session being scheduled. This is the Clearing Your Field 101. This tool is sold separately or at a ​discount bundled with a 1st time session. This tool is incredibly powerful and potent. Everything that Deb teaches continuously comes back to you "being your own guru" and these experiential tools are to be utilized for teaching as well as "training wheels" until you engage with the details yourself on your own. You'll receive a confirmation email including Conference Call details. An MP3 recording of your session will be emailed to you via Hightail for you to download and utilize how you choose. Many people re-listen to these recordings several times. You have two options to choose from in order to purchase the prerequisite Clearing Your Field tool(s) that are required before booking a session. 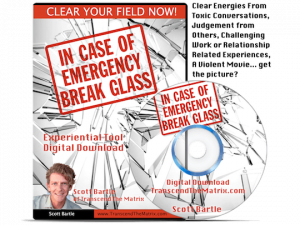 Right now the only tool that is mandatory is Clearing Your Field 101, but as you know, we can’t stress enough the importance and power to engage with 102 and then on to the rest of the series which won’t be released right away. This would be $399 if purchased separately. It’s discounted $22 if purchased here with this bundle. This would be $465 if purchased separately. It’s discounted $43 if purchased here with this bundle.